Unfortunately, Anderson and Chael will not be joing forces on TUF Brazil. The next installment of The Ultimate Fighter in Brazil will feature a fiery matchup of coaches as Wanderlei Silva faces off with Chael Sonnen, but it won’t include a UFC legend, who had to turn down an opportunity to appear on the show. 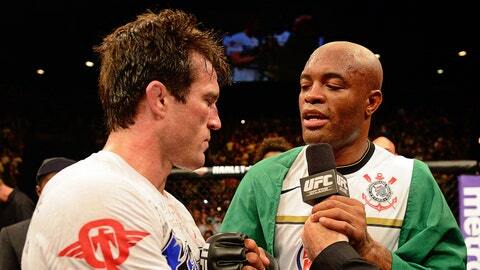 Recently, Sonnen had stated that he was reaching out to former UFC middleweight champion Anderson Silva to ask him to participate in the season and join his coaching staff. The history between Sonnen and Silva is quite lengthy, but following their second fight that ended in 2012 it seems the rivalry was finally put to bed. Sonnen respected Silva so much after dueling with him for the better part of two years that he wanted him to be a part of his coaching staff as he works with a group of young Brazilian fighters all vying for a shot to get a contract with the UFC. It is true I did get invited, but unfortunately I’m not in Brazil so I’m not going to be able to go down there and help. The invite was no joke because Silva received word through his manager Ed Soares that Sonnen was interested in bringing him in as a coach, but unfortunately timing didn’t work out for former middleweight king to participate. "It is true I did get invited, but unfortunately I’m not in Brazil so I’m not going to be able to go down there and help," Silva revealed on a conference call Tuesday. "But I think for the sport it would be something that would be great especially because all the guys competing are all Brazilian, so it would be great to go on either team and help them, but unfortunately I’m not going to be in Brazil and not going to be able to help." Silva is one of the few top level UFC fighters that has yet to participate in a season of The Ultimate Fighter. The idea of coaching on the show certainly interests the Brazilian icon, but it’s not something he can even entertain right now. My focus is on Chris Weidman. I’m not thinking of anything else. First things first is taking back the middleweight title that’s currently wrapped around Chris Weidman’s waist. If Silva is successful in his bid to beat Weidman at UFC 168 then maybe he can think about The Ultimate Fighter. "Everything’s possible, but my focus is on this fight right now," Silva said. "My focus is on Chris Weidman. I’m not thinking of anything else."